It feels like I just wrote one of these, but in looking back it was actually a month ago – where does the time go?? 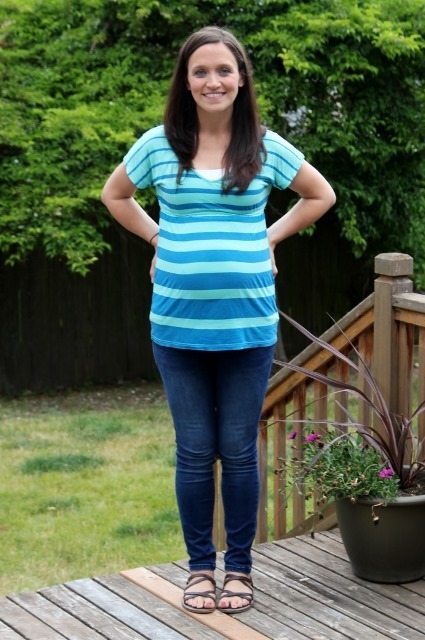 A lot sure has changed since my last update – we’re in a new house, and my belly is looking – um, enormous. I left off last time at week 20 – halfway there – but forgot to take a picture during week 21. Oops! Second pregnancies are definitely a lot more laid back. So we’ll move right along to week 22! 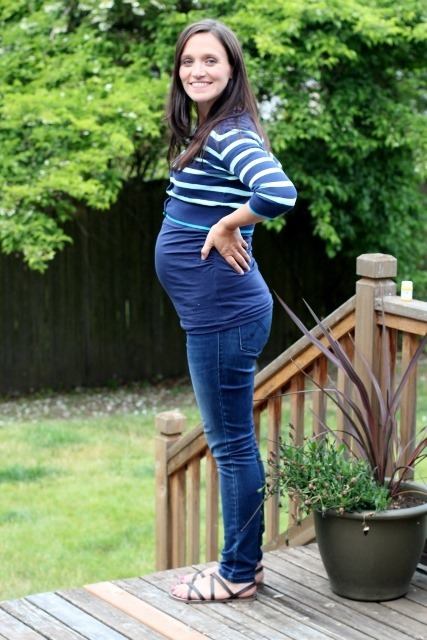 The belly is large and in charge now, and I’m in maternity clothes full time other than some button downs and cardigans that I can leave hanging open. The most fun change as I’ve continued to get bigger is that I finally feel lots of big KICKS. I forgot how much I loved that part of pregnancy. Every night when we watch TV on the couch, I find myself completely distracted by the party going on in my stomach. Casey and I went to a concert last night, and baby boy was going nuts! Hopefully he will be born with an appreciation for my moody girl music. Don’t mind my bleached out face above – weird evening lighting. 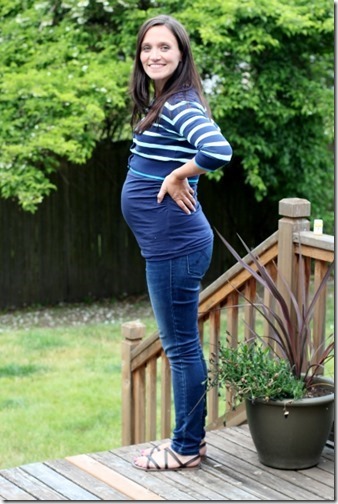 I think I’ve finally hit a pretty good second trimester groove. No more sickness and my appetite seems to be relatively normal. My energy levels still aren’t quite where I wish they were, but I think that probably has as much to do with just being a mom to an active toddler than anything else. Two weeks ago I went to my first prenatal yoga class, which felt wonderful. 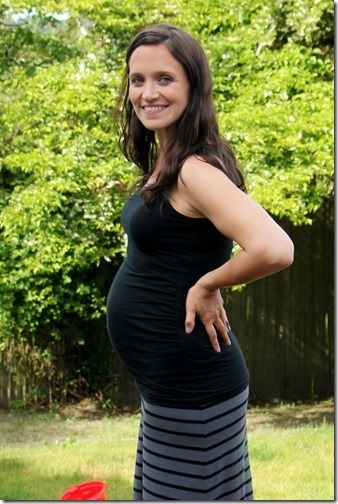 I really enjoyed my yoga classes last time, and I promised myself I’d start them earlier in my second pregnancy. At my current stage and size, it’s mostly just for a good stretch and mental focus – which I desperately need. With everything going on, I haven’t really spent time thinking about or focusing on this pregnancy the way I did last time. Yoga gives me a chance to do just that, and it feels really special to connect with this new little guy. 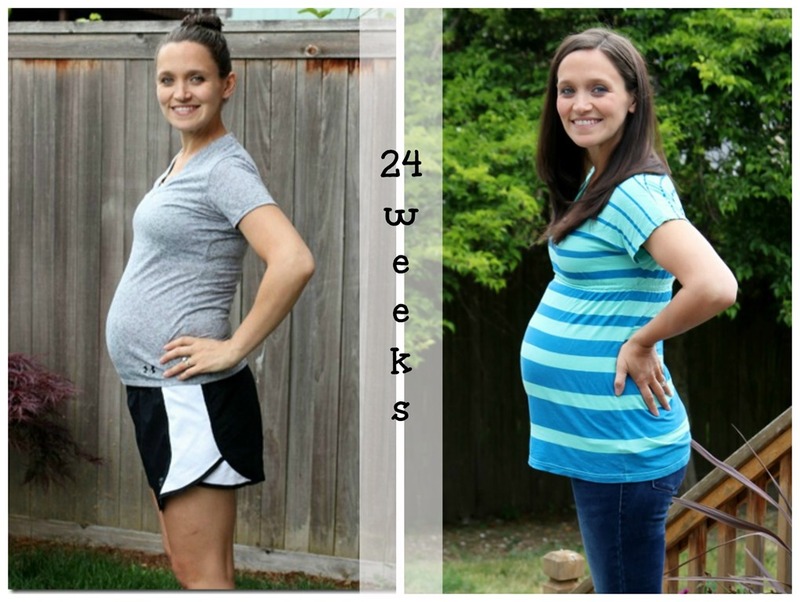 Here are last week’s photos – 23 weeks! Definitely still a bit bigger than last time, but I know that’s to be expected the second time around. I feel like my diet has been crap for weeks on end, and I finally feel like I’m cleaning it up and taking advantage of all the delicious summer produce rolling into the markets now. We are eating big green salads with our dinners almost every night, and I’m trying to really watch my sugar and carb intake (which was previously out of control). Now that my stomach is much more of a presence, I’m finding it harder to do things with Cullen, and it’s frustrating. A few nights ago he had a really bad night of sleep (nightmares, maybe?) and I had to spend a few long stretches of time rocking him in the glider in the middle of the night. All he wanted was comfort and cuddles, but every time he tried to lay directly across the front of me I’d start struggling to breathe. When we rock at night or read books, I have to position him over on my side now. I don’t know if it’s pregnancy or if I’m just getting lazy, but I also just find myself wanting to sit down a lot more than I used to. When we go to the playgrounds, I’m the mom who is looking around for a bench to sit on while he plays. I feel bad that I’m not as active and energetic as I used to be, but it is what it is. 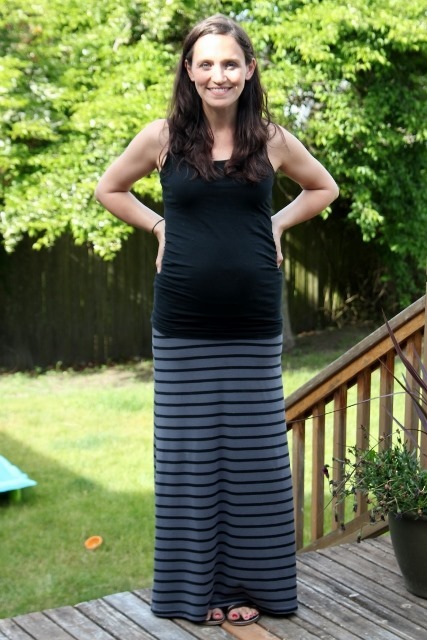 I have no idea what on earth I wore during my last pregnancy, because I feel like I have so few maternity clothes! Or maybe I just needed them earlier this time around? I’m resisting the urge to invest in much more (feels silly the second time around), but I’m already growing tired of my one pair of jeans and rotation of five t-shirts. 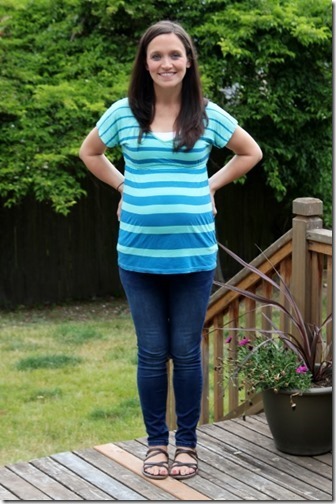 As of yesterday, I am 24 weeks – SIX MONTHS! – pregnant. I had a mini panic as I was driving to mom’s group yesterday, realizing that the weeks are flying by and I’ve done very little thinking about or preparing for this arrival. Time to get serious! I feel like this is the first comparison photo where you can really tell how much bigger I am the second time around. Definitely looking a few weeks ahead of where I was last time. With that said, this past weekend was the first time I actually sort of “forgot” I was pregnant, and felt like my normal self again. 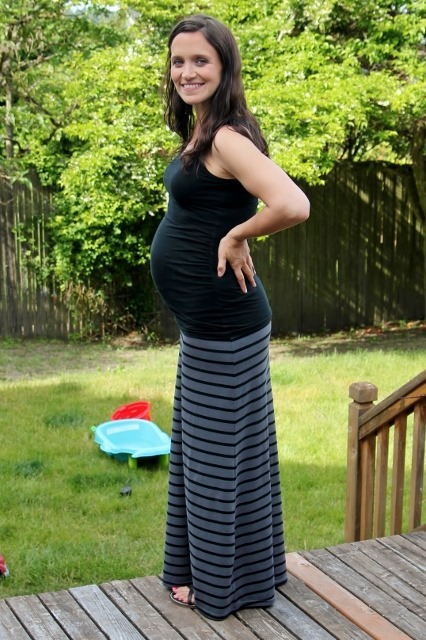 I felt like that through so much of my first pregnancy, and it’s been a bit of a struggle to deal with so much sapped energy and physical fatigue this time around. But as of now I’m feeling great and feel pretty much normal, despite the large reminder every time I glance down. 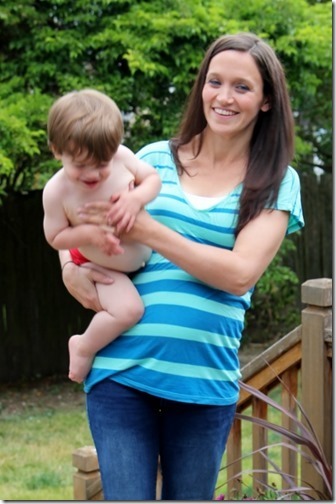 I went running twice in the past week – once with the jogging stroller and once without. Both were difficult, and even somewhat painful. I think my running days are probably numbered. I promised myself I’d quit when it didn’t feel comfortable anymore, and I think that is likely approaching. But I’m going to try a few more times and see how it goes before I switch to walking for good. I’m also really enjoying yoga, and am heading back to Barre3 this weekend after a short hiatus! Most exciting development this week is that we might have a name picked out! We have one name in mind that we both really like and that we both agree feels like a good fit for this little guy. But we’re still looking at lists and ideas in case anything else jumps out. First (and last? 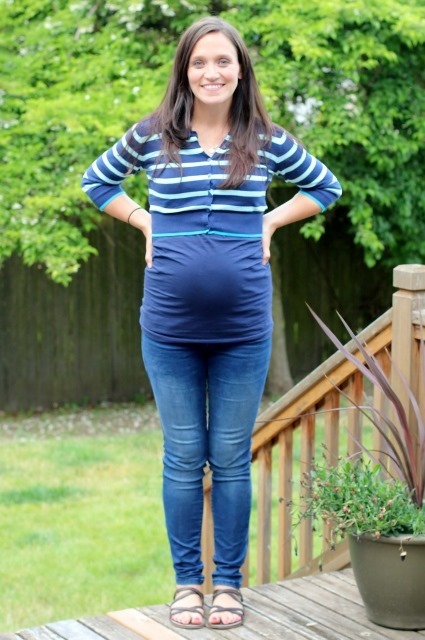 haha) bump shot of this pregnancy. The belly is big and so is the booty. I’ve gained about 12 pounds so far – guessing that’s about normal, although I haven’t been to the doctor in a few weeks. Most importantly, who’s belly is bigger? I laughed when my mom came to help us move and started freaking out when she saw me lifting big boxes. I had to remind her that my days of doing “no heavy lifting” are way over. I haul this 28-pound sack of wiggly energy around all day! 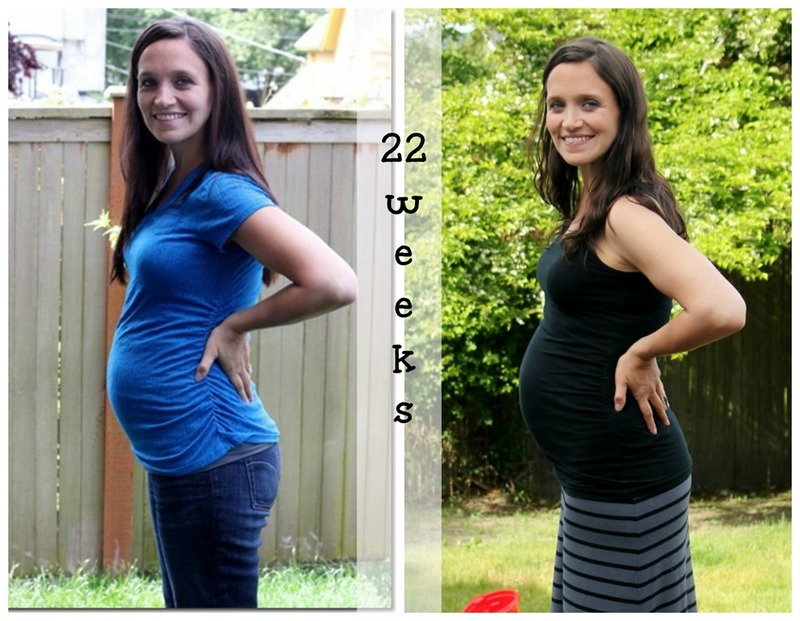 Only a few weeks left in the second trimester, which is very hard to believe. I hope that my increased energy and good spirits continue for this next stretch to the end! « Previous PostOrcas Island Adventures. 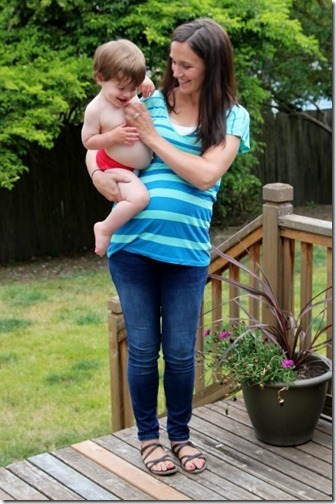 Next Post » Stroller Derby. You look great. I too love reading your updates so please keep them coming. 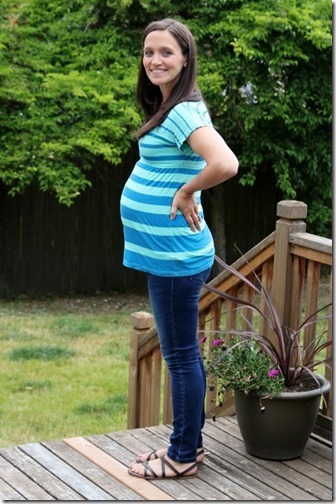 Now that I’m expecting my first, I look forward to reading your weekly updates on the regular. Quick question – where is the maxi skirt from? You’re looking great! So fun to hear updates. Also loved seeing your weekend getaway. Are your sandals comfy? Looking for a new pair. I think you look great! 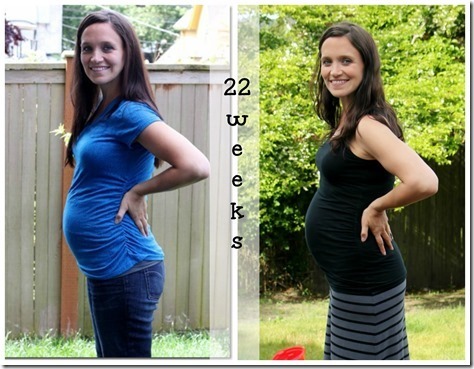 In fact, I think week 24 really agrees with you – you are looking the best you have the entire pregnancy (which is saying a lot because you always look wonderful). Can’t believe how fast these next months will fly by and very exciting news that you may have found the name!! The week 23 pictures from this pregnancy to last really are crazy different, but you look great! You look SO great! :) I’m glad you are feeling okay at this point. I am wondering about your Barre classes. Do you have to make any major modifications during that? 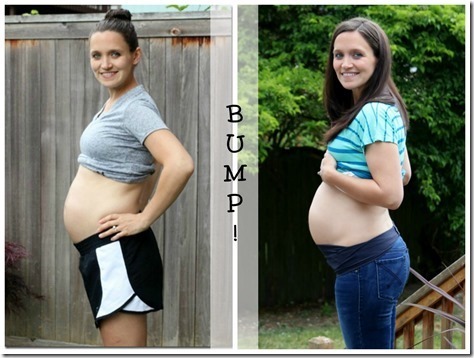 Did you in the first trimester? It seems like a possible good workout for pregnancy so I’m curious. Thanks! Yes! Wondering the same thing! I always love your shoes! May I ask where these grey/brown scrappy ones are from? You look wonderful! I love hearing the updates on how this pregnancy – and the experience of it – is different from the first. 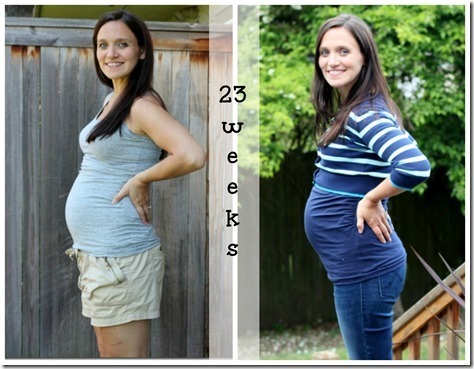 Pingback: Daily Garnish » Blog Archive » 2nd Pregnancy: Goodbye, Second Trimester (weeks 25-27). Have a healthy and beautiful day.